Once on the shore of Lake Superior, there lived a lovely Indian girl, named Leelinau. She was slender and tiny, with soft dark eyes, and little feet. And whenever the Moon rose faint and white while the Sun was setting, she danced in a Pine grove by the shore. And when she danced thus, her mother called: "Come into the lodge, Leelinau, for the silver Moon is rising. Soon the Little People, the Fairies, will come out to play among the trees. And they carry away dancing maidens." And Leelinau returned sorrowfully to the lodge, for she longed to see the Fairies. Summer after Summer, on moonlit nights, the Little People joined hands and danced in the Pine grove, and their sweet voices were heard by Leelinau sitting in the lodge. And when the Indians slept, the mischievous Fairies came creeping in, and Leelinau, waking, heard their low laughter in the dark. They rustled about, and hid the fisher-boy's paddle, plucked the feather from the headdress of the hunter, and carried away nuts and fruit. And in the morning Leelinau saw their tiny footprints in the sand dunes by the lake. And so it happened Summer after Summer. When the long cold Winter nights came, the mother sat by the fire, and told tales of Fairyland. How deep in the Earth, all was warm and the flowers bloomed and the birds sang, and the Little People feasted and were happy. And Leelinau's heart was filled with longing to visit Fairyland. And so it happened Winter after Winter. Now, on a Summer day, a handsome brave came to woo Leelinau. Her mother dressed her for the marriage. She braided her hair with sweet grasses, and put her best garments upon her, and led her out to the marriage-feast. 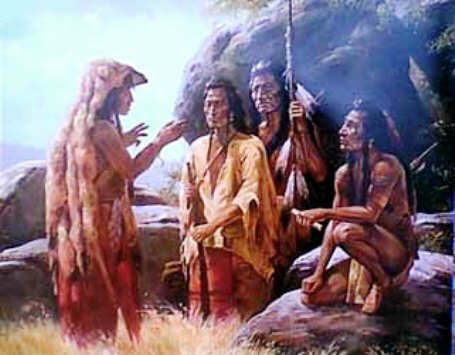 And the braves and squaws and youths and maidens of the Chippewas, for miles around, came to the feast. But Leelinau sighed and wept, and begged that she might go alone once more to the Pine grove before she became a bride. Her mother said, "Yes." So at evening time Leelinau wound wild flowers in her hair, and filled her arms with tassels of the Pine. Then she hastened to the grove. Darkness fell, and Leelinau did not return. The Moon rose and shed its white beams on the lake, but the maiden did not come. The bridegroom and guests went to search for the bride. They wandered through the grove, and sought up and down the shore, but Leelinau was gone. And no one saw her go, except one poor fisher-lad, who was paddling his canoe near the land. He watched her wandering through the grove, and dancing with a bright Fairy Chief, whose green plumes nodded high above his head. And Leelinau was never seen again on the shore of Lake Superior.